Without the communities of the Bushbuckridge area near Kruger National Park, Marula Natural Products Pty Ltd would not exist. 42 communities harvest the marula fruit and crack the nuts to produce the kernels that produce the magical marula oil. The relationship was built over a seven-year process, and for the past three years, Marula Natural Products' purchases go to support 2,400 women in the Bushbuckridge area in the Limpopo Province in South Africa. It starts with our Community Liaison Officer, Felicia Chiloane, who has established committees in each of the 42 villages. 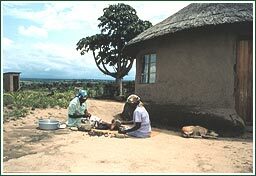 Committees are made up of members who are selected by the women of the village to represent them. The committee structures in themselves are empowering to the local women, and provide a wider platform for development. The committees also take responsibility to distribute the nuts back to the 2,400 women in their villages. When kernels are extracted, the committees sell these back to Marula Natural Products. Cash for kernels and fruit is distributed back to the women through the committees. The Committees are remunerated for their role in the supply chain and play a key function in Marula Natural Products' success at commercialisation of this precious natural resource. The Committees are also key representatives in the Marula Farmers Trust, which will hold ownership in Marula Natural Products. The Trust, which is under development, uses profits to the benefit of the wider community. Our Community Liaison Officer also works with the committees to ensure regeneration and the sustainable harvesting and management of Marula trees in homesteads and the communal lands. In her role as Community Liaison, Felicia also works with wider stakeholders such as tribal and civic representatives, who are active supporters of our work in their communities. The chiefs and indunas will even fine people who cut Marula trees in their jurisdiction. How have women have been empowered through their relationship with Marula Natural Products?